The bhavacakra (Sanskrit; Pāli: bhavacakka; Tibetan: srid pa'i 'khor lo) is a symbolic representation of saṃsāra (or cyclic existence) found on the outside walls of Tibetan Buddhist temples and monasteries in the Indo-Tibetan region. In the Mahayana Buddhism, it is believed that the drawing was designed by the Buddha himself in order to help ordinary people understand Buddhist teachings. 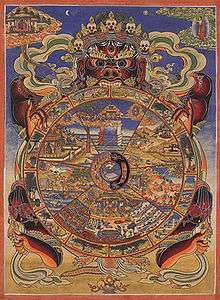 The bhavacakra is popularly referred to as the wheel of life, and may also be glossed as wheel of cyclic existence or wheel of becoming. Legend has it that the historical Buddha himself created the first depiction of the bhavacakra, and the story of how he gave the illustration to King Rudrāyaṇa appears in the anthology of Buddhist narratives called the Divyāvadāna. One of the reasons why the Wheel of Life was painted outside the monasteries and on the walls (and was really encouraged even by the Buddha himself) was to teach this very profound Buddhist philosophy of life and perception to more simple-minded farmers or cowherds. So these images on the Wheel of Life are just to communicate to the general audience. 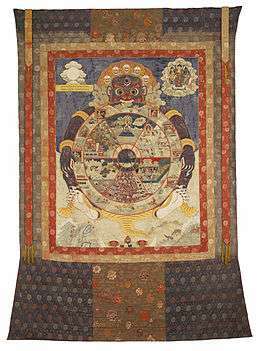 A traditional Tibetan thangka showing the bhavacakra. This thangka was made in Eastern Tibet and is currently housed in the Birmingham Museum of Art. Symbolically, the three inner circles, moving from the center outward, show that the three poisons of ignorance, attachment, and aversion give rise to positive and negative actions; these actions and their results are called karma. Karma in turn gives rise to the six realms, which represent the different types of suffering within samsara. The fourth and outer layer of the wheel symbolizes the twelve links of dependent origination; these links indicate how the sources of suffering—the three poisons and karma—produce lives within cyclic existence. The fierce being holding the wheel represents impermanence; this symbolizes that the entire process of samsara or cyclic existence is impermanent, transient, constantly changing. The moon above the wheel indicates liberation. The Buddha is pointing to the moon, indicating that liberation from samsara is possible. In the hub of the wheel are three animals: a pig, a snake, and a bird. They represent the three poisons of ignorance, aversion, and attachment, respectively. The pig stands for ignorance; this comparison is based on the Indian concept of a pig being the most foolish of animals, since it sleeps in the dirtiest places and eats whatever comes to its mouth. The snake represents aversion or anger; this is because it will be aroused and strike at the slightest touch. The bird represents attachment (also translated as desire or clinging). The particular bird used in this diagram represents an Indian bird that is very attached to its partner. These three animals represent the three poisons, which are the core of the bhavacakra. From these three poisons, the whole cycle of existence evolves. In many drawings of the wheel, the snake and bird are shown as coming out of the mouth of the pig, indicating that aversion and attachment arise from ignorance. The snake and bird are also shown grasping the tail of the pig, indicating that they in turn promote greater ignorance. Under the influence of the three poisons, beings create karma, as shown in the next layer of the circle. One half-circle (usually light) shows contented people moving upwards to higher states, possibly to the higher realms. The other half-circle (usually dark) shows people in a miserable state being led downwards to lower states, possibly to the lower realms. These images represent karma, the law of cause and effect. The light half-circle indicates people experiencing the results of positive actions. The dark half-circle indicates people experiencing the results of negative actions. We create karma in three different ways, through actions that are positive, negative, or neutral. When we feel kindness and love and with this attitude do good things, which are beneficial to both ourselves and others, this is positive action. When we commit harmful deeds out of equally harmful intentions, this is negative action. Finally, when our motivation is indifferent and our deeds are neither harmful or beneficial, this is neutral action. The results we experience will accord with the quality of our actions. Propelled by their karma, beings take rebirth in the six realms of samsara, as shown in the next layer of the circle. The third layer of the wheel is divided into six sections that represent the six realms of samsara, or cyclic existence, the process of cycling through one rebirth after another. These six realms are divided into three higher realms and three lower realms. The wheel can also be represented as having five realms, combining the God realm and the Demi-god realm into a single realm. God realm (Deva): the gods lead long and enjoyable lives full of pleasure and abundance, but they spend their lives pursuing meaningless distractions and never think to practice the dharma. When death comes to them, they are completely unprepared; without realizing it, they have completely exhausted their good karma (which was the cause for being reborn in the god realm) and they suffer through being reborn in the lower realms. Demi-god realm (Asura): the demi-gods have pleasure and abundance almost as much as the gods, but they spend their time fighting among themselves or making war on the gods. When they make war on the gods, they always lose, since the gods are much more powerful. The demi-gods suffer from constant fighting and jealousy, and from being killed and wounded in their wars with each other and with the gods. Human realm (Manuṣya): humans suffer from hunger, thirst, heat, cold, separation from friends, being attacked by enemies, not getting what they want, and getting what they don't want. They also suffer from the general sufferings of birth, old age, sickness and death. Yet the human realm is considered to be the most suitable realm for practicing the dharma, because humans are not completely distracted by pleasure (like the gods or demi-gods) or by pain and suffering (like the beings in the lower realms). Animal realm (Tiryagyoni): wild animals suffer from being attacked and eaten by other animals; they generally lead lives of constant fear. Domestic animals suffer from being exploited by humans; for example, they are slaughtered for food, overworked, and so on. Hungry ghost realm (Preta): hungry ghosts suffer from extreme hunger and thirst. They wander constantly in search of food and drink, only to be miserably frustrated any time they come close to actually getting what they want. For example, they see a stream of pure, clear water in the distance, but by the time they get there the stream has dried up. Hungry ghosts have huge bellies and long, thin necks. On the rare occasions that they do manage to find something to eat or drink, the food or water burns their neck as it goes down to their belly, causing them intense agony. Hell realm (Naraka): hell beings endure unimaginable suffering for eons of time. There are actually eighteen different types of hells, each inflicting a different kind of torment. In the hot hells, beings suffer from unbearable heat and continual torments of various kinds. In the cold hells, beings suffer from unbearable cold and other torments. Among the six realms, the human realm is considered to offer the best opportunity to practice the dharma. In some representations of the wheel, there is a buddha or bodhisattva depicted within each realm, trying to help sentient beings find their way to nirvana. 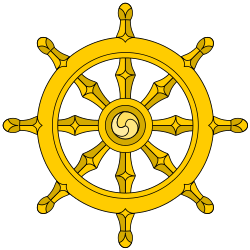 The outer rim of the wheel is divided into twelve sections that represent the Twelve Nidānas. As previously stated, the three inner layers of the wheel show that the three poisons lead to karma, which leads to the suffering of the six realms. The twelve links of the outer rim show how this happens—by presenting the process of cause and effect in detail. The wheel is being held by a fearsome figure who represents impermanence. This figure is most commonly depicted as Yama, the lord of death. Regardless of the figure depicted, the inner meaning remains the same–that the entire process of cyclic existence (samsara) is transient; everything within this wheel is constantly changing. He has a third eye that symbolizes the wisdom of understanding impermanence. His four limbs (that are clutching the wheel) symbolize the sufferings of birth, old age, sickness, and death. A painting of the bhavacakra in Thikse Monastery, Ladakh. Above the wheel is an image of the moon; the moon represents liberation from the sufferings of samsara. The moon is nirvana [i.e. liberation]. Nirvana is the cessation of all the unsatisfactory experiences and their causes in such a way that they can no longer occur again. It's the removal, the final absence, the cessation of those things, their non-arising. The Buddha is pointing us to that. The truth of cessation is a personal discovery. It is not mystical and does not have any connotations of religion or psychology. It is simply your experience ... Likewise, cessation is not just a theoretical discovery, but an experience that is very real to you–a sudden gain. It is like experiencing instantaneous good health: you have no cold, no flu, no aches, and no pains in your body. You feel perfectly well, absolutely refreshed and wakeful! Such an experience is possible. Some drawings may show an image of a "pure land" to indicate liberation, rather than a moon. The upper part of the drawing also shows an image of the Buddha pointing toward the moon; this represents the path to liberation. So the Buddha's gesture is like the path to enlightenment. It's not that the Buddha is the cause of nirvana. The Buddha is a cooperative condition of our nirvana. He indicates the path to us, he points out to us what to practice and what to abandon in order to be liberated. When we follow the path, we get the result, which is nirvana. The nature of the path is more like an exploration or an expedition than following a path that has already been built. When people hear that they should follow the path, they might think that a ready-make system exists, and that individual expressions are not required. They may think that one does not have to surrender or give or open. But when you actually begin to tread on the path, you realize that you have to clear out the jungle and all the trees, underbrush, and obstacles growing in front of you. You have to bypass tigers and elephants and poisonous snakes. Drawings of the Bhavacakra usually contain an inscription consisting of a few lines of text that explain the process that keeps us in samara and how to reverse that process. From a psychological point of view, different karmic actions contribute to one's metaphorical existence in different realms, or rather, different actions reinforce personal characteristics described by the realms. The core question of Buddhist practice, after all, is the psychological one of "Who am I?" Investigating this question requires exploration of the entire wheel. Each realm becomes not so much a specific place but rather a metaphor for a different psychological state, with the entire wheel becoming a representation of neurotic suffering. "It is the beginningless round of rebirths that is called the 'Wheel of the round of rebirths' (saṃsāracakka). Ignorance (avijjā) is its hub (or nave) because it is its root. Ageing-and-death (jarā-maraṇa) is its rim (or felly) because it terminates it. The remaining ten links (of the Dependent Origination) are its spokes (i.e. karma formations [saṅkhāra] up to process of becoming [bhava])." A painting of the bhavacakra from Bhutan. A painting of the bhavacakra that depicts an emanation of the bodhisattva Avalokiteshvara in each realm. ↑ Dzongsar Khyentse (2004), p. 3. ↑ Dalai Lama (1992), p. 42–43. ↑ Dalai Lama (1992), p. 41-43. ↑ Sonam Rinchen (2006), p. 8-9. ↑ Ringu Tulku (2005), p. 30. 1 2 3 Dalai Lama (1992), p. 4, 42. ↑ Ringu Tulku (2005), p. 31. ↑ Khandro Rinpoche (2003), p. 65-90. ↑ Chögyam Trungpa (1999), p. 25-50. ↑ Dalai Lama (1992), p. 5-8. 1 2 Dzongsar Khyentse (2005), p. 2-3. ↑ Patrul Rinpoche (1998), p. 61-99. 1 2 3 4 Sonam Rinchen (2006), p. 9. ↑ Birmingham Museum of Art (2010). Birmingham Museum of Art: Guide to the Collection. London, UK: GILES. p. 32. ISBN 978-1-904832-77-5. Retrieved 2011-07-12. 1 2 Dalai Lama (1992), p. 43. ↑ Epstein, Mark (2004), p. 40. ↑ Epstein, Mark (2004), p. 17. ↑ Karunaratne, T. B. (2008), p. 14. Bhikkhu Khantipalo (1995-2011). The Wheel of Birth and Death. Access to Insight. Dzongsar Khyentse (2005). Gentle Voice #23, April 2005 Issue. Epstein, Mark (2004). Thoughts Without A Thinker: Psychotherapy from a Buddhist Perspective. Basic Books. Kindle Edition. Gampopa (1998). The Jewel Ornament of Liberation: The Wish-Fulfilling Gem of the Noble Teachings, by Gampopa, translated by Khenpo Konchog Gyaltsen Rinpoche. Snow Lion. Goodman, Steven D. (1992). "Situational Patterning: Pratītyasamutpāda." Footsteps on the Diamond Path, Crystal Mirror Series I-III. Dharma Publishing. Patrul Rinpoche (1998). The Words of My Perfect Teacher, translated by the Padmakara Translation Group. Altamira. Thubten Chodron. Articles & Transcripts of Teachings on Lamrim: The Gradual Path to Enlightenment. Dharma Friendship Foundation. Wikimedia Commons has media related to Bhavacakra.